The top 5 destinations for brothers and sisters seeking adventures abroad. It’s no secret that one of the unofficial aims of my blog is to encourage black people to travel. I have over 650(!) posts on this blog chronicling my adventures through 6 continents; from Amsterdam to Zanzibar and Zacatecas to Agra I try to show people like me that international travel is not only possible, but can be easily integrated into a lifestyle (with a little sacrifice and advance planning, of course). Given this, I was thrilled when I opened up my inbox last spring and saw an invitation from American television network TVOne to share my top 5 destinations for African-American travellers on air. As I’m always game to share the good word about travel, and particularly passionate about increasing travel within my community, I said yes immediately! Now, I have to admit that I had to think long and hard about which destinations would make the list. I wanted to select not only a geographically diverse set of places, but also places that have some sort of connection to black or African-American culture. Why these parameters? Well, as a black person of Afro-Caribbean descent, I always think it’s cool to go a city or region that has explicit links to my own background and history– I love finding a bit of “home” abroad (like I did in St. Lucia). However, it goes without saying that human beings usually travel to discover “the Other”; beyond the sights, we crave contact with cultures and practices that are often polar or diametric opposites to our own. As such, this was also something I took into consideration when thinking about which destinations would make the cut. So which places did I choose? Frei Antonio Vieira, 17th century missionary and preacher, once said that Brazil has “the body of America and the soul of Africa”. Indeed. South America’s largest nation has the world’s largest population of black people outside of the African continent, and the world’s second biggest black population after Nigeria. It is not surprising, then, that Brazilian culture is heavily shaped by the enslaved Africans that were brought there during the slave trade. 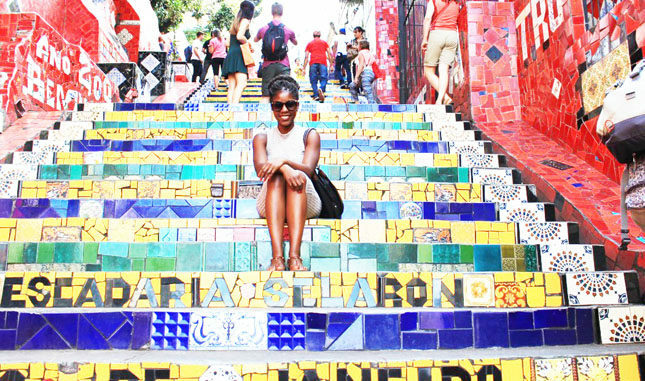 From the food, to the music, to the lovely shades of brown skin present in Brazil’s streets, the African diaspora is felt and seen everywhere. Add in a plethora of beautiful beaches, a weak currency, and epic scenery like Sugarloaf Mountain, and a Brazilian getaway is a no-brainer for the African-American traveler. If the Eiffel Tower and the views from Montmartre weren’t enough to make you pack your bags with a quickness, perhaps retracing the steps of late greats like James Baldwin and Josephine Baker will push you to visit. They, along with many other African-American entertainers and creatives, found both inspiration and adulation in the City of Lights. This great migration across the Atlantic to French soil reached its height in the 1920s and 1930s, with the aforementioned Montmartre becoming a popular hangout spot for these artists, writers, and singers. Interested? Walking the Spirit tours offers a comprehensive exploration of Black Paris on foot so you can learn more about this compelling part of African-American history. I’ve said before that Tokyo is probably the weirdest and most intriguing place I’ve ever been: its freaky fetish culture, bizarre fashion, and penchant for animatronics sharply contrast its Zen Buddist philosophies and respect for tradition and high culture. But what some guidebooks fail to highlight is the megacity’s deep appreciation for (and appropriation of?) hip hop and dancehall reggae musical genres: nightclubs playing this music dot the neon-lighted landscape. My friend and I hit up reggae club Garam in Shinjuku-ku, and were surprised to come across die-hard dancehall enthusiasts who both looked and sounded the part (Sean Paul, take note). One is just as likely to find B-boys as Harajuku girls in their wanders around town! A visit to the African continent is a must for any African-American seeking to understand a bit more about their roots, and a visit to this East African nation in particular promises a sojourn chock full of sun, sand, summits, and safari. From the peaks of Kilimanjaro, to the plains of the Serengeti, to the island paradise that is Zanzibar, Tanzania has long been on my list of places to visit, regardless of your colour or creed. The Etihad Airlines error fare that sent a flurry through the black travel community last Christmas has seen a number of African-Americans suddenly add the United Arab Emirates to their bucket lists. Cheap plane tickets notwithstanding, Dubai and Abu Dhabi are spellbinding destinations well-suited for first-timers to the Middle East. As global cities that are more cosmopolitan and less strict than their Gulf neighbours, they offer a window into a culture dominated by opulence and luxury. Impressive superlative sights like the Burj Khalifa, extreme activities like dune bashing, and a rollicking nightlife make these emirates well worth a visit.